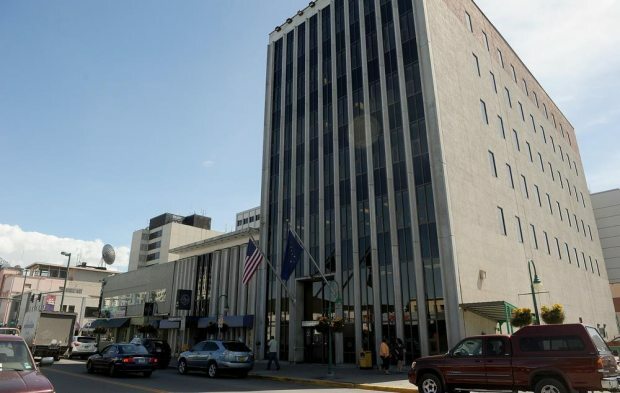 Legislators who have had enough of their tired, cramped and worn-out office building in downtown Anchorage say that after years of failed efforts to move out they've found a fix that will work: Revamp and expand the old space. After just minutes of public debate Friday, the Legislative Council, the joint House-Senate committee that conducts the Legislature's business, agreed to put the power for negotiating a deal with the building landlord in the hands of the council chairman, Rep. Mike Hawker, R-Anchorage. If everything works out, legislators will stay put on Fourth Avenue in a remodeled building expanded with additional space next door now in the building occupied by the Anchor Pub and Club. It's a sole-source deal that required the council to amend its procurement procedures. That was justified, Hawker said, because the current lease expires May 31, 2014, giving the council little time to act, and legislators wanted to stay downtown, where there is little property available. Hawker will be negotiating with the Legislature's new landlord, Mark Pfeffer. The politically active architect and developer has made a name for himself for public-private real estate deals and already is part of the group that owns Anchorage City Hall. Hawker will have help from the Alaska Housing Finance Corp., a favored agency of the Legislature. The council agreed to let Hawker pay the agency up to $50,000 to represent legislators in negotiating a deal. The six-story building housing the Anchorage Legislative Information Office, at 716 W. 4th Ave., is dilapidated and substandard, Hawker said. The single elevator is slow. There's only one big room for legislative hearings, and it's on the second floor. The building is cold in the winter and hot in the summer. Employees drink from bottled water coolers because the tap water is questionable. "It's just at the end of its useful life," Hawker said Friday after the council meeting. "The Legislature needs to make a commitment to the future. Looking at where we are at here, we chose to go with the option of letting the landlord modify this building and extending our lease." The building occupies a prime downtown spot. Public records show the owner as a limited liability company headed by Anchorage restaurateur and businessman Bob Acree. Pfeffer is gaining an ownership share in the corporation and will be the managing partner, Hawker said. Efforts to speak with Pfeffer were unsuccessful. He sat in the audience during the public part of Friday's meeting but dashed out as it wrapped up. The deal won't solve a parking crunch that had been mentioned earlier as a reason to move on. Legislative staffers may be directed to park elsewhere during busy times to open up slots for the public, Hawker said. Pfeffer and Acree have a short-term option to buy the Anchor Pub building next door, which is essential to adding needing office space, Hawker said. The idea is to erect a taller structure there and connect it with the Legislature's current building. The existing legislative building will be gutted and the staff and legislators will have to temporarily move into space Pfeffer will secure, Hawker said. The location hasn't been determined. The whole project should be complete soon after the 2014 legislative session, he said. The plan is for the building to get a fresh new look inside and out. There will be new elevators, new bathrooms, a new heating and air conditioning system, more windows, and more space for hearing rooms and visiting legislators. Rep. Bill Stoltze, R-Chugiak, said he had resisted spending more money on legislative offices and was "hesitant about sole source procurement." He said he came around after being assured the revamped building could hold the entire Legislature, which would be beneficial for a special legislative session. "We're not talking about this as a capital move. There's a whole other process," Stoltze said. The redone building should feature a large hearing room that could hold all 40 House members as well as one that could accommodate the 20-member Senate, depending on how close legislators are willing to sit to each other, Hawker said. The state will put in some money up front but also will pay more over the life of the lease for higher-end space, and more of it, Hawker said. The financial terms have yet to be hammered out. "At this point, I'm not going to put a number out there because I don't want to compromise my ability to negotiate with the landlords," Hawker said. The council agreed Friday to cap the project's cost at whatever new office space is going for. The Alaska Housing Finance Corp. will determine that, under one of the decisions made Friday. The council met an hour and a half in a closed-door session on the real estate deal before ratifying its decision to go forward in a short, open meeting. They didn't take a roll call vote, but everyone indicated they were in favor of it. Besides Hawker and Stoltze, Reps. Max Gruenberg, Craig Johnson, Lance Pruitt and Peggy Wilson -- who was on the phone -- participated, as did Sens. Lyman Hoffman, Kevin Meyer, Lesil McGuire, Dennis Egan and John Coghill, who also called in for part of the meeting. Also calling in was Sen. Peter Micciche. Pfeffer is an active political donor in both Anchorage and Alaska legislative elections, giving to Democrats as well as Republicans. In the public meeting, Stoltze said he wanted to note on the record that he hadn't talked to Pfeffer about the project but had received campaign contributions from him in the past, which were on file for the public to see at the Alaska Public Offices Commission. He received a total of $850 during the 2011-12 campaign cycle, according to APOC records. Hawker said the real estate deal is with Pfeffer because he's a landlord in the building. But he figured most of the lawmakers at the table, himself included, "have at one time or another been supported by Mr. Pfeffer." APOC records show Hawker received the maximum $500 from Pfeffer in each of the last two years. Most of the legislators on the council indicated by nodding or raising their hands that they had gotten campaign donations from Pfeffer, too. "I'm just checking. I don't remember," Johnson, R-Anchorage, said. APOC records show that he received $500 in each of the last two years, too. The state currently pays $56,000 a month for 29,000 square feet within the building, or a little less than $2 a square foot, Hawker said. The building also houses Buzzbizz, a media production studio, but after the makeover, the Legislature will be the lone tenant, Hawker said. The Legislature should end up with double the space, and the price per-square-foot for a like-new office could be double the current rate, the council chairman said. The Legislature already has set aside about $25 million for renovation of the state Capitol in Juneau and improved Anchorage office space, with most of that going for the Juneau project, Hawker said. In May, the council put out a "request for information" to see what other office space might be available and only heard back about two buildings, one in Midtown built over a ground floor parking lot and too small for the Legislature, and the old Carr-Gottstein headquarters in a South Anchorage industrial area, Hawker said. Neither would have worked as well as their current space, he said. Earlier efforts for a better Anchorage legislative office went bust. Legislators in 2011 considered constructing a new office building next to City Hall, but financing by the Anchorage Community Development Authority fell through. The same year, the Legislature lost out to Nana Regional Corp. in trying to buy the former Unocal-Chevron building downtown. Copyright © 2015 Alaska Dispatch Publishing.